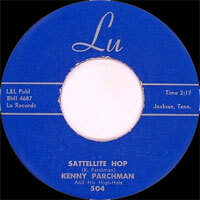 Chanteur Rockabilly US, né Kenneth Parchman, le 15 Janvier 1932 près de Jackson (Tennessee). En 1955, après son service militaire, il prit un boulot pour la Wells Fargo et commença à se produire dans les clubs locaux où il rencontra Jerry Lee "Smoochy" Smith. Un contrat avec le label Sun fut signé en août 1956 et une session organisée qui donna "Love Crazy Baby / I Feel Like Rockin'" qui resteront inédits. Rien ne se matérialisant chez "Sun", l'année suivante il enregistrera pour le label "Jaxon" puis, en 1958, pour le label "Lu", deux labels de Jackson. Une dernière session pour "Sun" en 1959 ne donnera rien. Il continuera à se produire régulièrement dans les clubs de Jackson avec Carl Mann et Rayburn Anthony. Après une longue maladie, il est décédé le 2 Juin 1999. 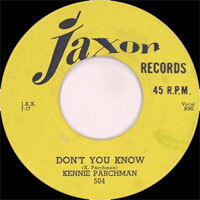 Kenny Parchman had the misfortune to be an also-ran in the history of Sun Records, but not for lack of talent, as the surviving evidence demonstrates. While Elvis Presley, Carl Perkins, Jerry Lee Lewis, and Johnny Cash carved out the beginnings of national (and international) followings on the Memphis-based label, Parchman never got any further than a record number assigned to his single of "Love Crazy Baby" b/w "I Feel Like Rockin'," which was thereupon canceled, for reasons lost to time. Born on January 15, 1932 near Jackson, TN, he was drawn to the music he heard on the radio, and his parents bought him a guitar while he was still a boy. He learned to play from his mother, and it seemed like he might find a future, at least part of the time, in music. He later made a living driving a truck for Wells Fargo, but spent a lot of his spare time hanging around the clubs in Memphis, taking in the music. He finally formed his own band in 1955. The outfit, heavily influenced by Carl Perkins' band of the same period, busied themselves playing local dances and record hops. The core of the band, known as the High-Hats, featured Jerry Lee Smith on piano while Parchman sang and played lead guitar. By mid-1956, they'd made some demos for Sam Phillips at Sun Records, and they were signed in August of that year, with a planned debut of "Love Crazy Baby," which was subsequently canceled. He recorded other sides, including several originals, for Sun, none of which ever got released. Finally, in the summer of 1957, he received an offer of a contract from the newly founded Jaxon label, based in Jackson, TN, and cut sides for them, making his belated debut as a commercial recording artist with "Treat Me Right" b/w "Don't You Know." Ironically, it was after that release that Parchman cut what is usually thought of as his best classic track, "Tennessee Zip," for Sun Records, and again, it sat on the shelf for a quarter century. Although they continued to play some hillbilly-style country numbers, the band had pumped up their drum sound and pushed the tempos and slid easily into the booming rock & roll groove of the era, and their music morphed directly into a hot rockabilly sound -- just as effective on their records -- that audiences 25 years later devoured as fast as it poured off the grooves of their singles. 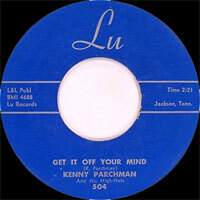 He was later signed to the LU label, also based in Jackson, which issued his second single, "Get It Off Your Mind" b/w "Satellite Hop," in 1958. He and the band were still getting lots of work locally, playing a mix of hillbilly-style country music and rock & roll. He later left the music business to start a very successful home construction company in Jackson; he was amazed to learn in the '70s and '80s of the discovery of his unissued Sun sides, and the degree to which his classic recordings of the '50s were idolized, especially in Europe. His health began failing in the early '90s, however, and he passed away in 1999 at the age of 67 after a long illness.